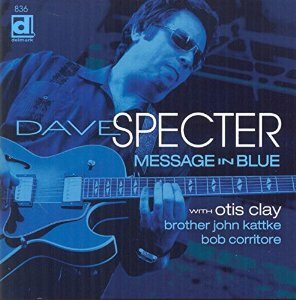 Few musicians are as deeply embedded in Chicago blues as is guitarist Dave Specter. 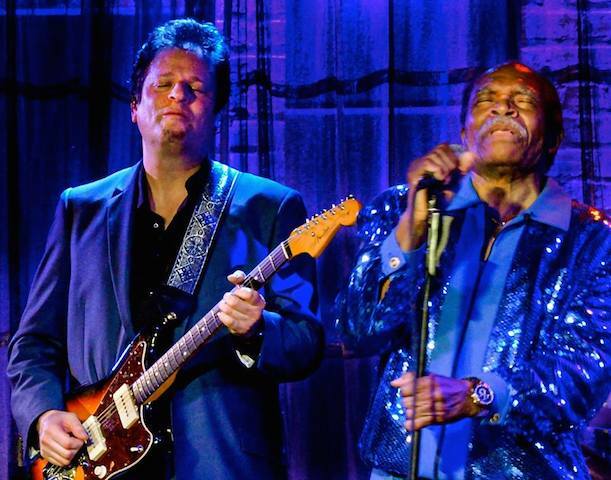 A Windy City native, Specter grew up in a hotbed of modern blues and in his time has played with some of the town’s greatest blues practitioners, not least among them Hubert Sumlin, Buddy Guy, Otis Rush and Son Seals, in addition to producing some of Chi-town’s finest younger blues artists. But he’s also made a name for himself as a solo artist in his own right, hailed widely as one of the finest six-string masters of his generation. To be sure, on this, his tenth album, Specter and his mates have made a fine blues record—this is born out in instrumentals such as the thick, churning “Opus De Swamp,” with a heavy-duty Bob Corritore harmonica serving as a muscular second voice to Specter’s foreboding guitar; the evocative “The Stinger,” with its Latin flavoring (courtesy Victor Garcia) behind Specter’s crying upper neck workouts; the Allmans-influenced “Funkified Outta Space,” an equal opportunity showcase for Specter’s funky guitar and Brother John Kattke’s jazzy organ underpinning and robust left-hand solo flight. 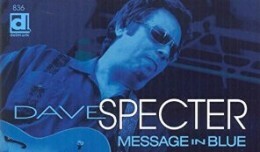 But Specter has also gone and made a fine classic soul and R&B album that shows these styles to be as vital as ever. He gets a big assist in this effort by the gravel-voiced authority of stellar vocalist Otis Clay on three memorable cuts and the aforementioned Brother John Kattke on another trio of tasty offerings. Clay enters with bravado on Jimmy Jones’s hard hitting howl “Got to Find a Way,” a tune that was a minor hit (#31 R&B) in 1965 for Chicago club singer Harold Burrage, a tragic figure who died in 1966 at the home of Tyrone Davis, who always pointed to Burrage as one of his primary influences. Specter and company honor the song and a fellow Chicago artist with a raucous, driving arrangement fueled by a quartet of rousing horns and intensely delivered backing vocals by Theresa Davis and Diane Madison. These elements support a red-hot Otis Clay vocal that straddles the gospel and R&B worlds in the singer’s heated resolve to get his woman back and the ecstatic lift in his voice as he anticipates his efforts’ fruitful outcome. This cut alone would be enough to make you sit up and take notice, but Otis isn’t through. He returns on the next cut with a vocal so deeply remorseful and self-lacerating it’s almost painful to sit through—but in a real good way. The tune in question comes from the Bobby “Blue” Bland catalogue, specifically his 1973 Michael Omartian-arranged/Steve Barri-produced His California Album and was Bland’s first Top 50 chart entry since 1964, peaking at a quite respectable #10 R&B. With Specter’s stinging guitar wailing alongside him, Clay digs deep in wringing out both text and subtext from the double-edged lyric, sounding torturously conflicted about his feelings for a woman right up to the fadeout when his faint voice mutters, “This time baby, I’m gone for good,” sounding no more like he believes what he’s saying than he did when at the song’s forceful outset. Impossible at it sounds, Clay saves his best for his last appearance here, on a grinding, group harmony-styled treatment of The Falcons’ 1962 classic, “I Found a Love,” written in part by then-Falcon Wilson Pickett, whose mates in this all-star configuration of the group included future Stax star Eddie Floyd and the now-legendary soul songwriter Mack Rice (whose credits include “Respect Yourself,” “Cheaper to Keep Her” and the Wicked Pickett’s immortal “Mustang Sally”—this was a true supergroup in gestation. Over the slow dance tempo and the tight group harmony backing, Clay testifies like a man possessed, simply overwhelmed by finding “the love that I need” and shouting it to the rooftops with the fervor of a country preacher raining hellfire and brimstone on his rapt congregation—and Specter gooses him along with a series of stinging, pinched solos that up the intensity a few more notches when the harmony singers join in with smooth, gospel-rooted ensemble responses and drummer Marty Binder hits the skins with force and purpose. SELECTED TRACK: ‘Same Old Blues,’ the Don Nix-penned song, first recorded by Freddie King in 1971, as revitalized with Brother John Kattke on lead vocal on Dave Specter’s Message in Blue album. SELECTED TRACK: ‘I Found a Love,’ The Falcons’ 1962 classic, co-written by Wilson Pickett, as featured on Dave Specter’s Message in Blue album with Otis Clay on lead vocal. No one should be expected to compete with Clay’s vocal knockout punches but Brother John Kattke gives it more than the old college try on three numbers and adds an interesting texture to the proceedings with his smoother voice. The horn-enriched shuffle “Chicago Style” is an agreeable roll-call of top Chicago blues artists and homage to the city’s enduring blues scene, all delivered by Kattke with energy and conviction, to which Specter adds a tasty, nicely textured guitar solo midway through. Kattke’s finest moment comes on a slow blues from the pen of southern soul giant Don Nix and first heard on record via Freddie King in 1971, “Same Old Blues,” a heartfelt lament by a man stuck in a downward spiral of despair. Kattke sings it like he feels it—at times he sounds like Eric Clapton circa late ‘60s-early ‘70s—and finds depths of feeling without over-emoting; his tempered approach is mirrored in his deliberate piano support, leaving Specter free to cut loose with an anguished solo that voices the pain Kattke is barely keeping at low ebb. Kattke returns later with a rousing vocal turn on Lonnie Brooks’s “Watchdog,” a heated affair with a pumping arrangement and his own spirited excursion on the organ buttressing his hearty, upbeat vocal. So please: take your Sam Smiths, your Justin Timberlakes and the countless other soul/R&B poseurs of the day and play them some Dave Specter with Otis Clay and Brother John Kattke. As they slink off with their tails between their legs, crank up Message in Blue and feel the life-force within you and without you.